Nutrition Month is a perfect time to try out some fun no-bake recipes in the classroom. 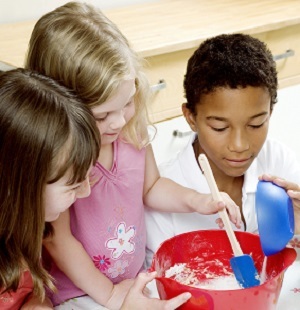 When kids cook they learn math and science concepts, improve fine and gross motor skills, and practice language and reading skills. While students are prepping the food, incorporate discussions about making nutritious choices, where are food comes from, and the kinds of nutrients our bodies need as we grow. Try one of these recipes to get your classroom cooking! 1. Place the banana into the mixing bowl and mash it with a fork. 2. Add the peanut butter and cinnamon and mix until the ingredients are blended together. 3. Break a graham cracker in half. 4. Spread the mixture onto half of the graham cracker. 5. Create a sandwich by placing the other graham cracker on top. 6. Continue steps 4-5 until all mixture is used. 7. Wrap the sandwiches in plastic wrap and place in freezer for 2-3 hours. 1. Stir oats, peanut butter, flaxseed, honey, cranberries, chocolate chips, and almonds together in a bowl. 2. Press into a 9×11-inch baking dish, using the back of a spatula to press into a flat layer. 3. Refrigerate mixture at least 1 hour. 4. Cut into 12 bars and wrap each individually in plastic wrap for storage. 1. Make the herbed cream cheese by combining the softened cream cheese with the chives, parsley, basil, salt and pepper, and lemon juice. Stir to combine. 2. Spread cream cheese in a thin layer over the tortillas. 3. Lay ingredients down the middle of the tortilla: for the turkey rollup, use turkey, carrots, and cucumber. For a “salad” rollup, use lettuce, carrots, cucumber, and avocado. Let the veggies extend past the edges on either side. 4. Roll up the tortillas as tightly as they’ll go. 5. Wrap each rollup in plastic wrap and refrigerate for one hour. 6. To slice, cut each rollup exactly in half, then line up the two halves and cut them in half again. Stand the end pieces up so that the veggies stick out the top.